This is the 23rd edition of our Q&A blog series titled "The Expired Eight". 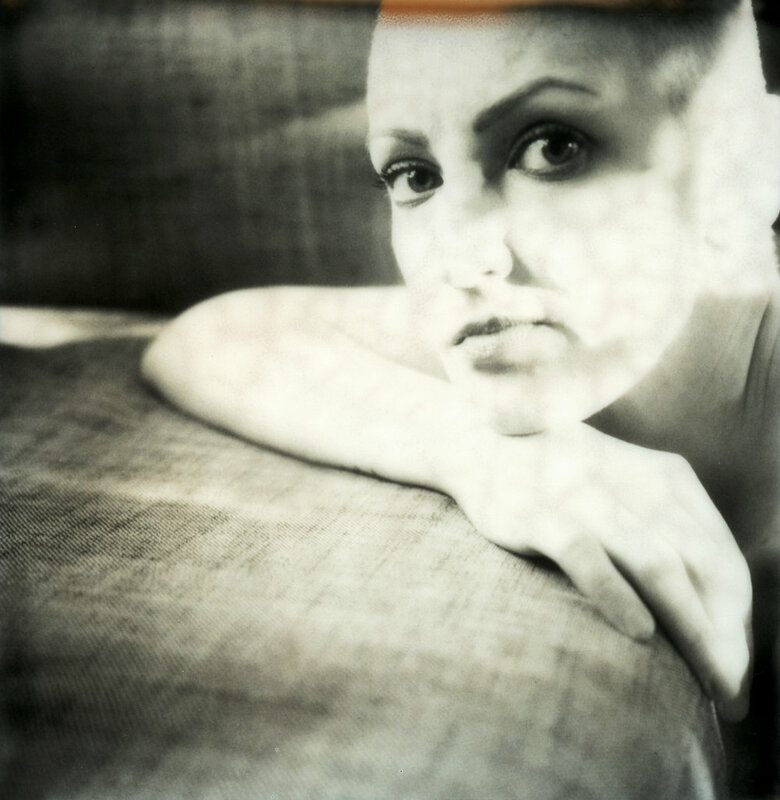 Our aim is to highlight instant film photographers using expired film in a variety of formats. Today's Q&A is with Dee Elegia! Dee Elegia is a self-taught photographer. She was born on the west coast of Scotland in 1981 and grew up right next to the sea; the sort of setting which creates an ache inside you when you're away from it for too long. Throughout school she was passionate about the arts and pictured herself as being a writer or a painter in the future. After school she studied fine art, but sadly grew disheartened with her work and struggled to find her voice. She drifted away from anything creative until 2011, when working as a model, she stumbled into photography — a medium she'd previously only ever used to document family and friends. She was soon making her own images behind the camera whilst using herself as a subject in an attempt to grow more comfortable and become a better model. In 2013, she relocated to Manchester, to dedicate herself to furthering her work and doing it for a living. Her photography is defined by a passion for the imperfect and the flawed. She uses analog and mixed media processes to explore OCD, bipolar disorder, and body dysmorphia. Her influences stem from numerous sources such as her childhood, her surroundings, and the people she chooses to photograph. Dee Elegia's work is rich and profound, filled with passion, strength, and intensity. It challenges the viewer to pause and to allow feelings to rise to the surface. Though her photos are often self-portraits, there is a universality in Elegia's work, where she explores states of emotion, an often rocky, treacherous inner terrain. Her self-portraits are courageous, exploring the things that bring her discomfort and relating the many nuances of mood and emotion, grappling with often-debilitating issues such as body dysmorphia and OCD. Making art, especially self-portraiture, is not for the faint of heart. It demands that we allow glimpses into the most private, vulnerable parts of ourselves, using our body, our poses, our facial expressions, various props, and locations as the vehicles for communicating what is true for us at that moment. Elegia does this with a seeming fearlessness. Regardless of the style of photos we choose to make, Elegia's brave work gives us permission and inspiration to dive into our work head first and to create photos passionately, with the same level of depth and honesty. She encourages us to not allow ourselves to be held back by our fears. Elegia's work with models has the same intense ambiance, inviting the viewer to explore a private, darkly moody world, the topography of human emotion, where optimism and the healing power of art shine through. Elegia's work has been widely exhibited and featured worldwide online and in print. Earlier this year she self-published a year's worth of her self-portraits in a 172 page 'zine, which sold out almost immediately. Presently, she is working on a new series which documents the unique eye that dyspraxia lends to her imagery. 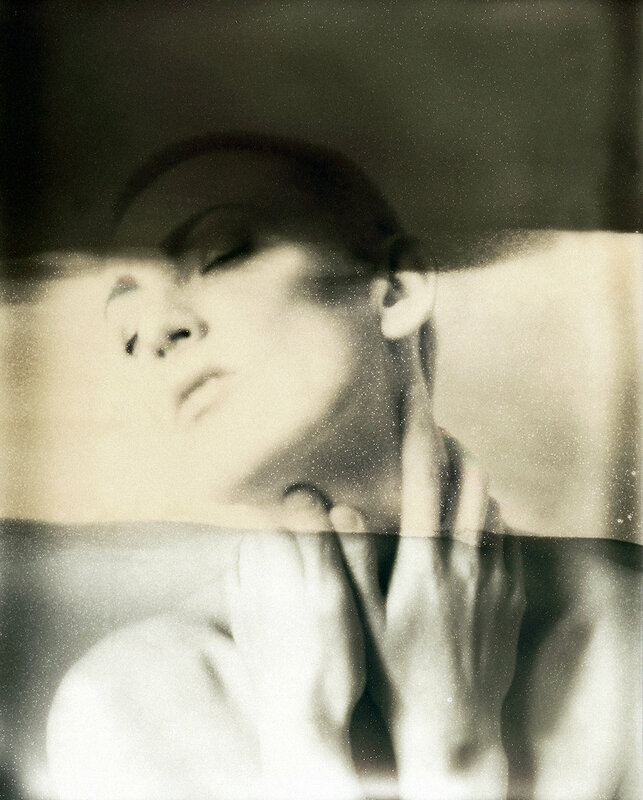 Of the numerous showings of her work, some of her recent exhibitions include: ExPolaroid's "Polaroid Is Not Dead," at Hotel Pasteur in Rennes, France in Spring of 2016; SHVR: "Traditional & Diverging Views of Beauty, Romance & Darkness," at The Fruit in Durham, NC in Fall of 2015; and Impossible Project's "Impossible presents 8x8" at the Hoxton Gallery in London in February 2015. Printed publications of her work include: The Optiko Journal 2017, Photodarium Private 2018 Calendar, LOV Issue #2: Portraits, Hylas Magazine Volume 1: Loss, and She Shoots Film Issue 1: Self-Portrait. You can also read more about her from her features in Impossible Project Magazine, Analog Magazine, Emulsive, and Lomography Magazine! You can connect with Dee Elegia on Instagram and on her website! "There were two main goals behind my self-portrait work when I began: to learn how to feel comfortable in front of the camera, and to learn how to feel comfortable with how I looked in front of the camera. It was never my intention to go any further than this with the images, but I soon discovered that my interest drifted more towards the discomfort I felt from being studied through the lens, and where that stemmed from. I've learned that the curious thing about making myself the subject of my work, is that I sometimes feel so desensitized and detached from my own face and body that it's almost like looking at a stranger. I don't recognize the confidence and fearlessness that sometimes comes through in my images, because I never considered myself to be either of those. The level of awkwardness has never gone away, and I still find new things to loathe about my appearance every single time I make a new picture. I find the process cathartic and overwhelmingly positive, because I finally feel like I have a voice within my work, one which isn't solitary. 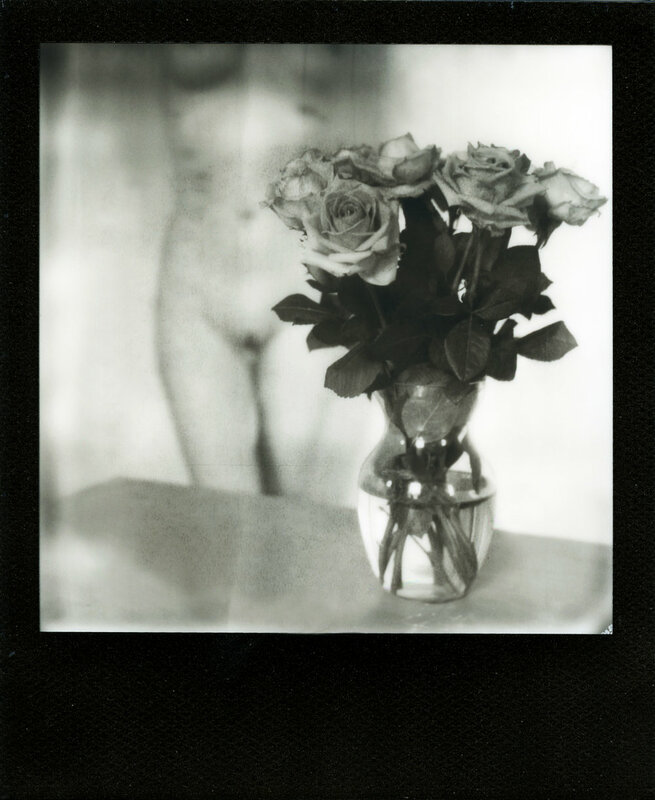 Instant film and its serendipitous nature enables me to express and capture the flawed aspects of myself, which I have been trying to make peace with through my work. I like manipulating the film as part of a conscious effort to ensure that my images don't all look the same, because I believe this reflects my ever-changing perception of how I feel about my appearance. The tangible elements of the film help me to create meaningful, imperfect and lasting ghosts of the past." Tell us about when instant film came into your life and what inspired you to keep using it. I started shooting instant film in late 2011, after I got my first Polaroid camera - a Supercolor 600. I'd wrongly been told that you couldn't get film for the cameras anymore, so the purpose initially was just to own one of my own. By chance, my friend and I were rooting around in a shop in Glasgow and I stumbled upon Impossible film on one of their shelves. That's when I discovered the Impossible Project and their mission to keep the film alive. I got my first pack online to try it for myself, and even though the shots I took with that first pack were pretty terrible - due to me, not the film! I was hooked. My first real successes with instant film came when I began shooting other models, and my intention with the film then was to really push the unpredictability of the formulas by shooting into the sun. I made a lot of hazy pastel Polaroids of models near the coast on Scotland, where I was still living at the time. As the formulas evolved, I learned to adapt my work to them, and it's something I've enjoyed most about using those films. If a new one is too clean for my tastes, then I'll keep it until it's expired or store it 'badly' to encourage it to create a different effect when shot. I've never lost my enthusiasm for instant film because I just don't think there's anything quite else quite like it. It's also what got me started in photography to begin with, and so I feel like I owe a lot to it. What attracted you to expired film? What's your favorite kind to use? I love the serendipitous elements of expired film. I like when I shoot a self-portrait and half of my face is missing due to an artifact in the emulsion or the texture creates a haziness or graininess. I feel those supposed 'flaws' emphasize the flaws I see in myself, and that I can use the film to capture it without saying it. Last year, I was really lucky to be given two packs of Time Zero film, and those shots are some of my favorites. I was able to use a pack purely on myself, making some really close up portraits, and the other pack I shot of my friend Faye, around Sheffield. I was doubly lucky to capture the famous flames in some of the resulting shots. I'm definitely a photographer that likes people as subjects. I don't really have an eye for anything else. I enjoy the contradiction of being a shy and timid person who chooses to work in a field where it often means I have to go meet a stranger and then take photographs of them. Before then I would avoid most other situations that would force me into that kind of scenario. Photography is the only thing I've found which has challenged my social anxiety because my love for it overwhelms my fears about anything else. I think my work is best described as unfinished, in that I don't feel I am anywhere near having gotten what I want out of it. I think I've progressed and evolved, and I enjoy the feeling of knowing I have more places to go with it and more things to say. Moreover, so much more to learn and fail at! I'd hope that my work reflects the curiosity I have about people - despite being an introvert. I love being behind a camera and the way it allows me to get close to someone via its lens. I'm captured by depth and strength, which is why I think I work best when I have a connection or relationship with the person I'm photographing. I work within my little circle of model friends most often. My friend Faye, I'd describe her as a muse because she's the person I've created the longest on-going body of work with, and she influences and inspires me a lot. I always feel confident about giving her a film or music reference as inspiration for how to dress or do her makeup, and she gets what I'm talking about. She gets as excited as I do about a new idea I have for us to shoot, and I feel lucky to have someone to help me realize my goals. What are the main difficulties and hurdles in obtaining and using expired film? I think that all film formats have their weaknesses and their strengths, and I choose what to shoot dependent on the conditions I'm working in. Instant photography has a tangible element to it, which means that it's great for pushing beyond just the initial shot. I guess I sort of embrace the weaknesses a lot of the time and try to be more creative. Impossible films have progressed and changed throughout the five or six years that I've been using them, and that's a factor that I really enjoy. Expired Polaroid film then adds a further element of mystery. I don't like all of my images to look the same, and if something is always producing the same look for me, I choose to alter how I use it so that it doesn't. I have a rule with buying expired Polaroid film that I stick to the packs expired in the nineties because those are the ones I've had the most success with. I also won't pay over £30 for a single pack, unless it's Polaroid Chocolate film, which I have never owned or shot with yet. I think my time has ran out for me to ever pick up that film. I own quite a few instant cameras. I think the Spectra is really underrated. I have the SE System and I broke the viewfinder in it quite a long time ago, so when I shoot anyone with it I very much have to frame and compose the image instinctively. I have replacements but I've grown used to working that way when I want to shoot that specific film. It's an added bit of fun! However, I think my SX-70 is my favorite because I love how close I can get to my subject with it, and the details it can pick up. Buying a cable release for that camera really enabled me to push myself further with my self-portrait work too. I remember being so frustrated when I only had my Supercolor because I wasn't able to photograph myself with it. I often have to use my toes to press the shutter release button on the cable, and I'm forever pulling it out and breaking the connector. The camera itself is also looking a bit battered and bruised, but that's what I like about old film cameras, they have their own quirks and history and that makes them unique. I think the most important thing to remember when it comes to experimenting is to just do it and not worry about mistakes. I have boxes and boxes of Polaroids and there are tons that didn't work out how I'd wanted. I've cropped my head off, the tripod has fallen over and I've over exposed, under exposed. Everything that could possibly go wrong when shooting has happened to me, and I'm sure to most other photographers. Mistakes are the best thing because you learn from them, and often you'll know what to alter next time to get it right. One of my tips would be to not throw away those shots that you think failed. 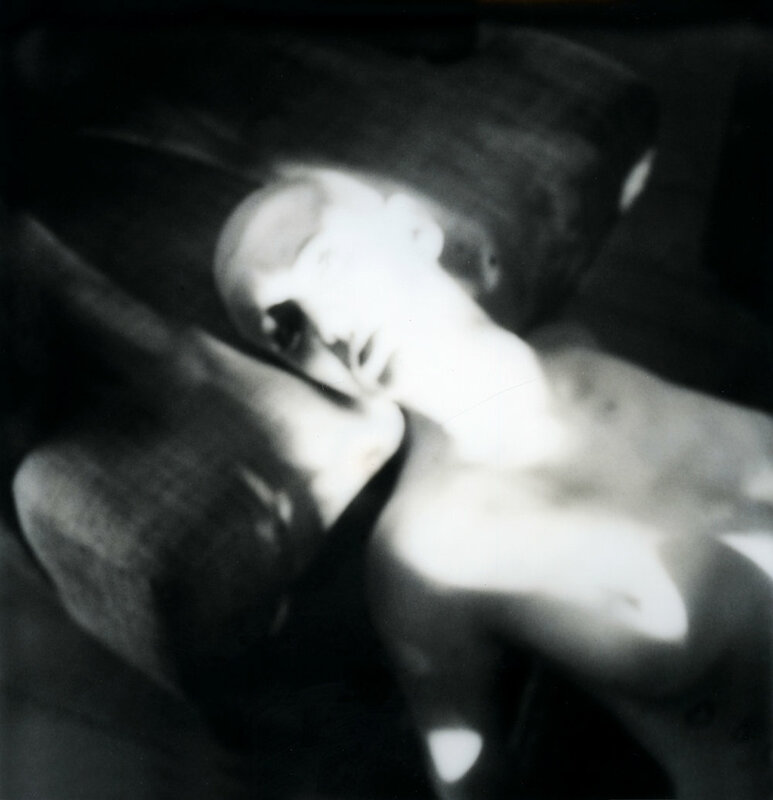 I've cut up so many over-exposed Polaroids to find a negative that is perfectly exposed. Or I've made emulsion lifts out of Polaroids that I absolutely hated at first, but went back to look at months later. Since Polaroid photography is about having a physical image in your hands instantly, it's good to then think about using that physical print to make something else from it. Even if you end up only keeping it for yourself. When you are not shooting expired Polaroid and Impossible films, what film are you shooting and why? Aside from Polaroids, I shoot a lot of 35mm and 120. Color is very much what I love using in my photography, and I lean towards saturated films like Kodak Ektar. I really love the experimental films by Lomography, such as Lomochrome Purple and redscale. I've recently been shooting with Cinestill film because I work with ambient light a lot, and I've been interested in really pushing the intense grain of that film in low light conditions. Much like with instant film, I adapt my roll film choices to what my subject and setting is, and I'm more inclined to keep the quirky films and experimental film soups to my self-portrait work because I'm comfortable with harsh effects on my own face and body. Whereas I wouldn't always want to capture someone else in a less flattering way. It's actually one of my fears - making someone else look bad in a photograph. I always hope that the model likes how she looks in the images I take of him/her. Do you have any instant photographers who inspire you? There are so many instant photographers that I'm inspired by. The community aspect of the film community is something which has had a particularly encouraging effect on me, because when I started out I was the only person I knew shooting with those films, and I was always being criticized for it. So finding other instant people online on places like Twitter and Flickr was amazing because I felt like I'd finally found a bunch of like-minded folk who were as passionate and excited about film as I was. During that period, photographers like J Caldwell and the infamous Dr Polaroid were people that I looked to for those sort of cool portrait Polaroids that I love. Marcelo Yanez is someone I've always felt is a bit special because his work is just so authentic. SF Said is my favorite Polaroid photographer, and he also wrote some of my favorite books. I was incredibly lucky to model for him back in late 2014, and that whole day I spent with him I felt like a child in a daze. Every 'Roid Week I feel a little burst of butterflies in my stomach if he leaves a nice comment on any of my pictures. He's one of the best!